Rosemary Esther Black (nee Burr), was the youngest of four, with Colleen, Purvis and Judith the older siblings. The family lived at various Wellington addresses before settling in Lower Hutt. Rosemary attended Eastern Hutt School and then Hutt Valley High School (her eldest great grandchild attended the same primary school and started at HVHS this year). During this time, Purvis, her only brother, died during relatively minor surgery. Rosemary started a 6th form year, but her mother was unimpressed with progress and secured her a job as a dark room technician in the X-ray department of Wellington Hospital. Just before she turned 18, Rosemary started her nursing training, joining Judith, who was already one year into her nursing career. After qualifying, she obtained a permanent position at the then-new Hutt Hospital. She worked in casualty and the diabetic clinics as well as running the only electro-cardiograph machine in the hospital. It was during her nursing career she met Gordon Black, a railways clerk, at one of the Hutt railway stations. They married in 1948 and bought a dairy/general store in Plimmerton in 1950. Bronwen was born in late 1950. Three and a half years later the family moved to Ōtaki, buying a poultry farm at Ōtaki Beach. Jocelyn and Lorraine arrived in the family and the couple began selling off sections of the poultry farm to enable the purchase of 4 hectares of bare land just south of Ōtaki on the main road. A packing shed was built and the family moved into that while Gordon and friends built the family home. Blacks Gardens, as it was known, had a rocky start – literally, as the old river terraces produced hundreds of tonnes of rocks, all picked up by hand. The garden, however, was successful, with the summer crops sold in a roadside stall which Rosemary ran, or going to the Wellington or Auckland markets, where they sold under the Black Cat brand. With the help of the taxman, Gordon built an emergency “water tank” for the garden and for fire-fighting. It just happened to be about 16 metres long by 4 metres wide, with a ladder at the shallow end and handrails down the side. It was even partially heated so the fire-fighters wouldn’t get their hands cold! Swimming became an important family focus with both Rosemary and Gordon having key roles in the Ōtaki Swimming Club. Bronwen and Jocelyn swam at the national level for three years. Lorraine also swam and is still swimming, by now having done thousands more kilometres than Bronwen or Jocelyn ever did in their training. The independent Rosemary emerged when Gordon died in 1974. The market garden was leased out and later sold, enabling Rosemary to move to Waikanae. She became a district nurse there, took up painting, and completed a diploma of nursing as an extra-mural student. A fall brought her nursing career to an end so she decided to move to Taupō, closer to her daughters and her two sisters. Sadly, Bronwen died 15 years ago, and Rosemary lost a rock who had supported her after Gordon had gone. 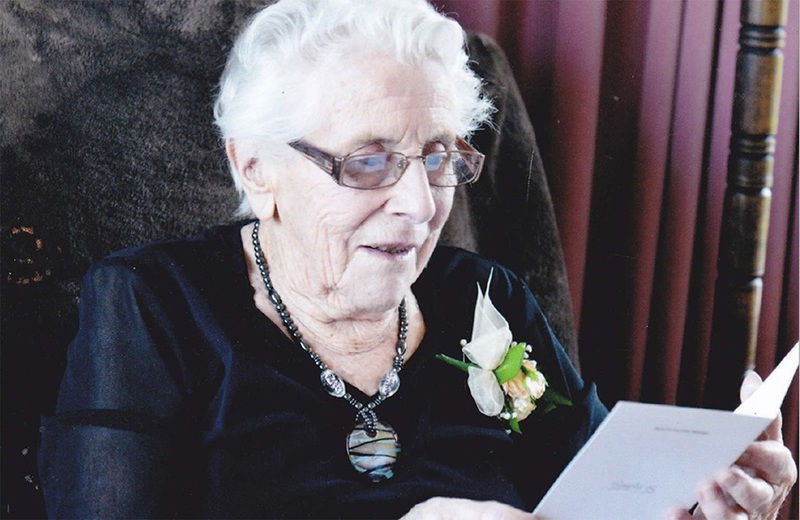 Rosemary finally moved to Feilding, close to Lorraine, and died at home on January 7, 2019. Original generation time 1.1848 seconds.